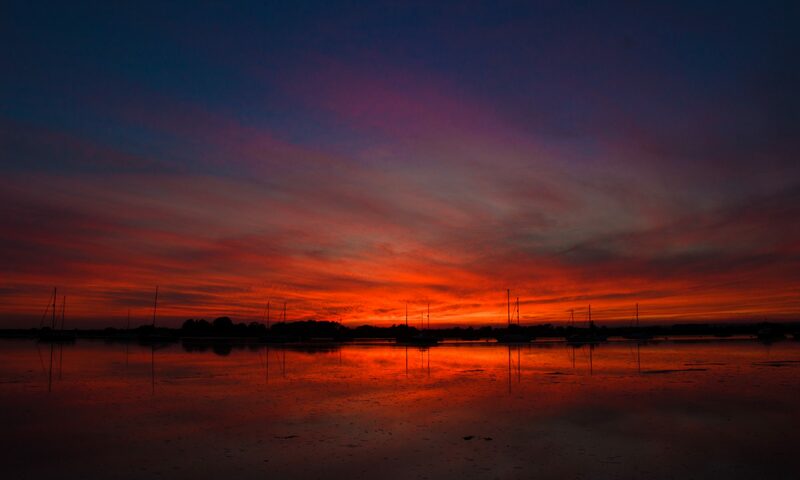 One of the best things about living in Brighton is how easy it is to get out to the countryside. Often I drive out to the Downs, or Ashdown Forest or somewhere, but this walk starts at my front door and within ten minutes I’ve left the city and the green fields are all around me. A collection of a few pics that, for one reason or another, weren’t part of other sets, or haven’t been posted before. Hover and click for descriptions. 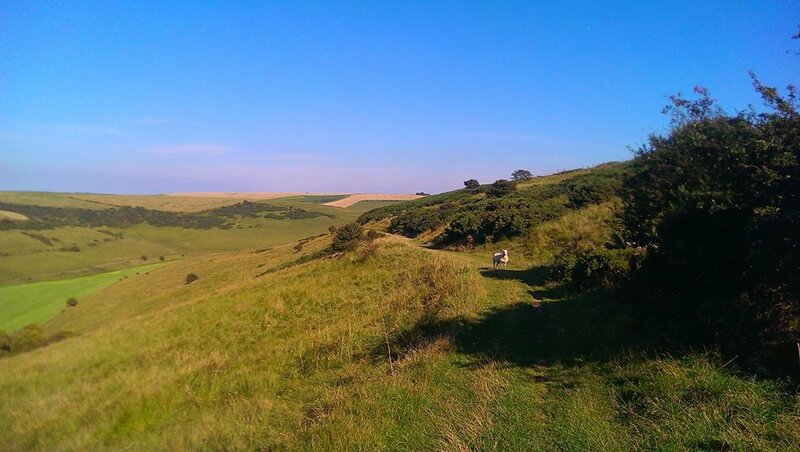 Just the other side of the Downs from Brighton is a path that winds up the steep, northerly slopes called Burnhouse Bostall. For thousands of years shepherds lead their flocks up and down from the Weald to the Downs and back, carving these deep paths into the chalk as they went. Now the sheep are no longer driven up these paths, it is left to the rain and the boots of walkers to carry the job on. Now, try not to get too excited, but we’re back at that exceptional beauty spot The Downs Hotel in Woodingdean (served, excitingly, by both the No. 22 and the No. 2). I know it’s tempting, but try to resist its obvious charms. There’s a Tesco Express at the petrol station as well as a Co-op just over the junction, but if you can tear yourself away, turn left at the Downs Hotel and walk up the hill on Falmer Road. Just past the end of the buildings on the right is a small car park with a couple of tracks leading from it. 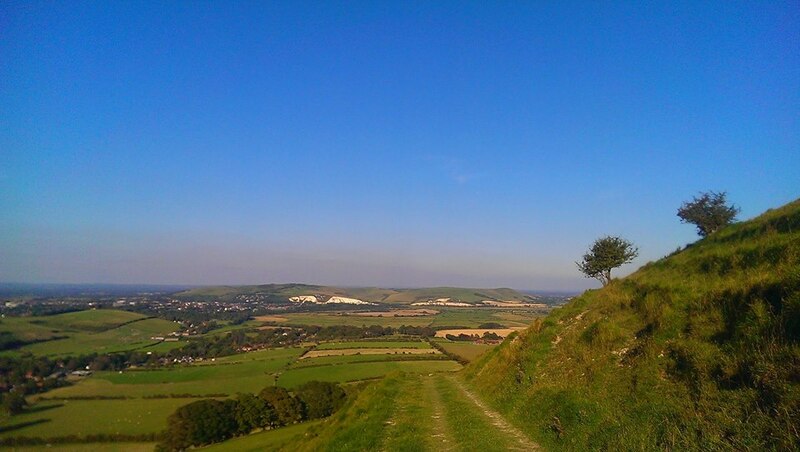 The left-hand track is Drove Avenue, which becomes Jugg’s Road and is a popular and straightforward route to Lewes, but not a patch on my route (obviously), which goes through Castle Hill National Nature Reserve and has some of the best dip-slope/dry valley scenery on the South Downs. Follow the right-hand track, which I am sure you’ll be thrilled to know is called Norton Drive. Ahead of you, you will see a radio mast (you will also see, away to its left, another radio mast on the top of Newmarket Hill. So long as you’re heading initially towards the right hand of the two, you are going the right way. Well done!). Just before the radio mast, take the left-hand fork, with the fence on your right. 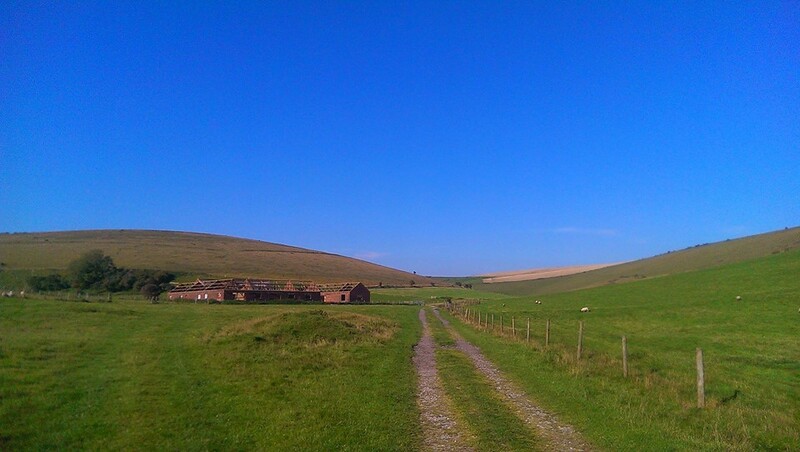 This path, I have decided, is one of the most beautiful on the South Downs and I shall brook no argument on the matter. To your left is Newmarket Bottom and Bullock Hill rises on your right. Follow the path all the way down and round to the right, round the end of Standean Bottom and back along the other side of the dry valley. Have we talked about dry valleys? Let’s talk about dry valleys. The most famous dry valley on the South Downs is Devil’s Dyke and I’ll do a Devil’s Dyke walk at some point I’m sure, but the important thing is that they were all created in the same way, some 10,000 years ago, at the end of the last Glacial Maximum (or ice age, if you’re not being a ponce about these things, although technically, as there’s ice at the poles, we’re still in an ice age, but whatever). The Downs were not covered by glaciers (they only came as far south as North Finchley Tube Station), but they were frozen solid (There’s more on this guff in my post giving an exciting geological history of the Downs). As the tundra melted, the melt-water formed rivers in the dips and depressions on the Downs and eventually wore valleys into the surface of the chalk. Once the ground had all thawed, the water ran out and the rivers disappeared, leaving dry valleys behind. So now you know all about dry valleys. You’re welcome. Anyhoo, you will now be walking along a track shaded by a slightly incongruous row of enormous London Plane trees. 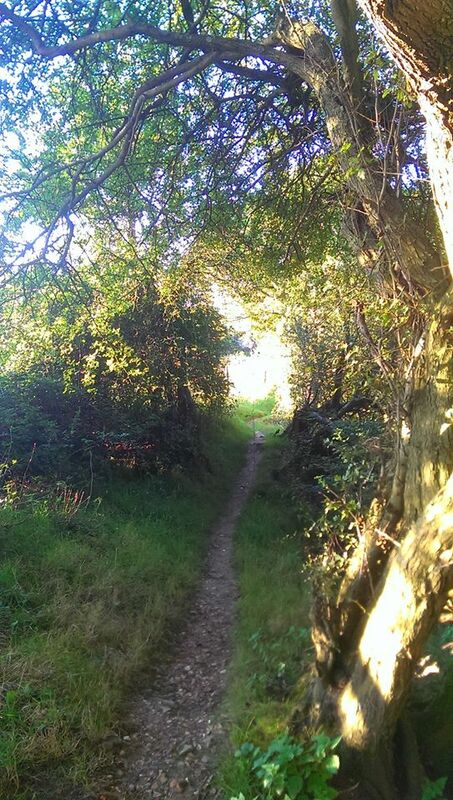 Be careful on this path, there are badger setts, some of the entrances to which are right in the middle of the path and perfect for unwary walkers to fall down. At the end of this path under a few big Ash trees, you will come to a junction of tracks, where you turn left, heading towards a collection of red-brick barns lacking somewhat in the roof department. Try as I might I have never been able to take a decent picture of them, but there’s always a certain glorious melancholy about ruined buildings, isn’t there? One day I will be there under the perfect conditions to take a picture that will capture that brooding melancholy of the abandoned… but I digress. Again. Sorry. Just past the barns, turn right, go through a gate with a fence on your right, turn right at the end of the fence and then you should see a path leading off to your left along the length of this cultivated field. Through a gate at the other end of the field, across another fairly small field and through another gate into a much bigger field. Follow the path straight on and round to the right. This field may well be full of moo cows, but don’t worry, they’re friendly moo cows and used to walkers. Do keep dogs on a short lead, though. You are now in Balsdean Bottom, which is a great name for a bottom, I’m sure you’ll agree. At the other end of this field you are presented with an exciting choice of gates, a new wooden one and and old, metal one. I like to go through the metal one, because I’m sentimental like that, but I shan’t be cross if you choose the wooden one, although I will silently judge you. Follow the wide track straight ahead, which will start to go uphill. On your right is another valley that glories in the name of Stump Bottom, but pay it no mind. It does no good to encourage that sort of behaviour. At the top of the hill, cross a cattle grid and go straight on. You are now at the top of a shoulder of Swanborough Hill and all of East Sussex is laid out at your feet. 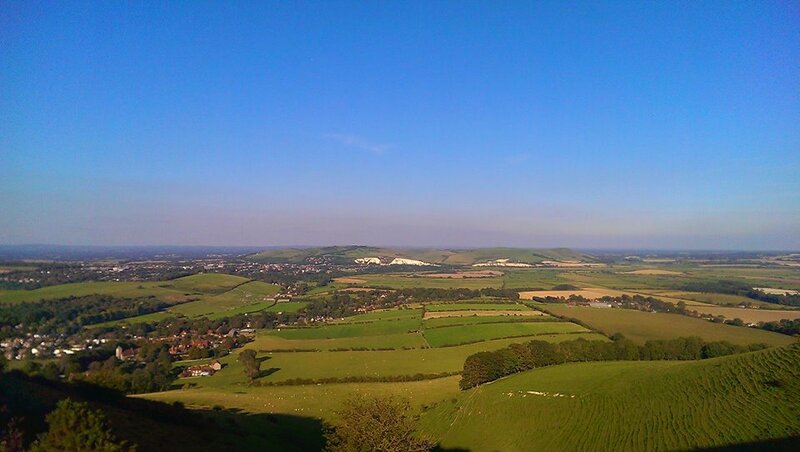 The village of Kingston Near Lewes is at the foot of the hill. 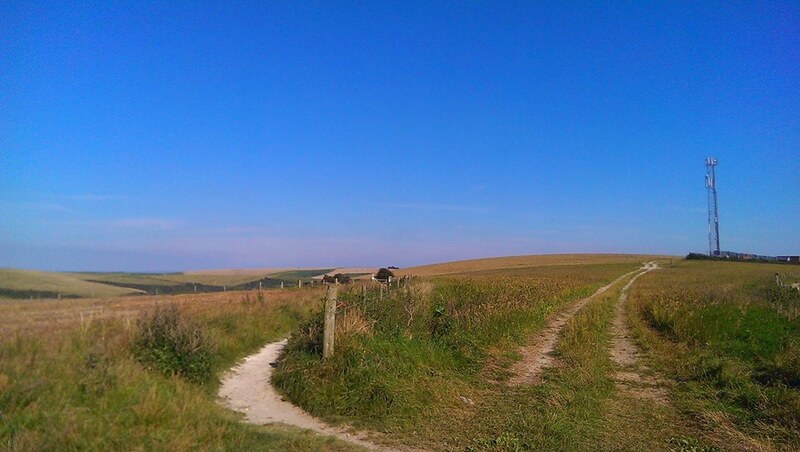 Dead ahead are the Lewes Downs, with the round, bald head of Mount Caburn at the southern extreme. The white cliffs are, imaginatively, called Cliffe, and the town to the left is Lewes, with its castle visible on its hill. I usually stop here for a roll up and a Double Decker and often find it hard to drag myself away from this view, which I regard as the finest in Sussex, even if you can see Kent in the distance. Try to ignore that misfortune. Leading down in front of you are two paths. One leads to the left and, very steeply, drops down to Kingston. You can go that way if you like. There’s a pub and everything. But it’s cheating, so I’m not going to describe it, so there. Take the right-hand fork, leading down and round a spur of the hills. This is Breach Road and leads, eventually, down to Swanborough, becoming metalled as it emerges from a small patch of trees. At the bottom of the road on your left is Swanborough Manor and the main Lewes – Newhaven road. Cross this carefully – it’s busy and fast here – and through a gate into wheat fields, the flat Ouse Valley suddenly around you. Take a moment as you cross this plain to look back at the hills you’ve just crossed. You will quickly come to a t-junction of paths in the middle of the field. Turn left and follow the path across the fields. 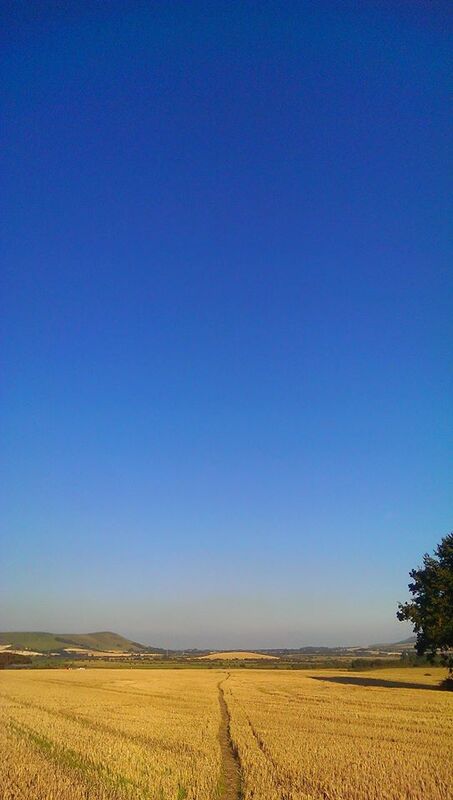 There is a small airstrip to your right. At the end of the field, the path goes through a gate and down some steps to a tarmac lane. It may well be completely surrounded by tall nettles, but you can get through. Turn right onto the lane and almost immediately left, just before the gates to a sewage works up along and almost within a hedgerow. At the end of this path you will come back out into a wide open crop field with the path obvious ahead of you. Cross the field and the next until you almost reach the road, then turn right with a large drainage dyke on your left, lined with tall trees and sports fields beyond. Follow the dyke (there’ll probably be swans and all that sort of caper) and at its end, turn left through a gate, across the end of a mown stretch of grass and through another gate onto a tarmac road. Turn right here and then left through a bridge under the A27. Follow the road round to the right, then turn left at the first junction. Follow this road under a low railway bridge and up to Southover High Street. To get to Lewes railway station, turn right and left at the second mini-roundabout, but take my advice and explore Lewes and its many pubs, if you have time.